Need new apps for your favorite device? Here are 64 iPhone, iPad and iPod touch apps that just hit the App Store. 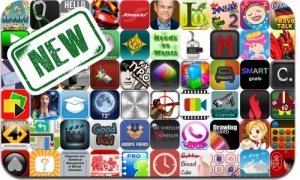 This new apps alert includes Robots Attack, Hello Cappuccino, Quick Route, Reincarnations: Uncover the Past, RG3 Touchdown, Impossible Quiz 2, Four in a Row, 2012 End Escape, Igloo Games Arcade, Solebon Pro Solitaire, and many others. German Travel Talk – Speak & Learn Now!